Open to the public 10 to 4.Sign-ups for this are being handled directly by Bedrock Gardens. To sign up, visit http://signup.com/go/BEgDrfP. To get credit for your hours, you must wear your GSA uniform while on duty, and make sure that they know you are a GSA. They will report GSA hours to us after the event.This year, Bedrock Gardens is hosting its third annual Fairy and Hobbit House Festival and Fundraiser. 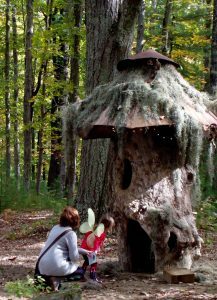 It will feature a Fairy & Hobbit House Trail with designer-built fairy houses, opportunities for children and grown-ups to build their own fairy houses, and:1st Lady of New Hampshire, Valerie Sununu will be reading from her favorite kids books with a visit on Friday and fostering a love of nature and creativity for all who visit. ​​​​Guest appearance on Friday and Saturday by Betsy Williams author of Are there Faeries at the Bottom of Your Garden? GSA s are invited to volunteer. 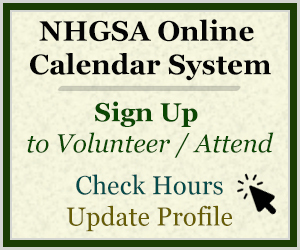 This is a GSA approved event, which means NHGSA will not be managing the volunteers for this event, but you will receive GSA volunteer service hours. You do not need to be a GSA to volunteer at this event. Not-yet GSAs can sign up directly. Fairy House Transport (golf cart): Help designers transport their designs to the FHH trail (or to golf cart operators for assistance). Parking Lot Attendant: During set up day, help direct designers to park and transport house to the FHH trail. During the event, Help direct visitors in parking lot at BG and at Mast Way School. Gift Shop (gifts, plants, membership): Looking for a tenured volunteer to help Gary and Kate in the gift shop, including setup and take down at beginning and end of each day. Gnome Depot Volunteers: Dress up in your fairy best and help kids (and grownups too!) select materials, such as bark, sticks, shells, acorns and more to build fairy houses along the trail. Information Booth: Tenured Bedrock Volunteers provide information to visitors, including garden maps, information about plants, and general garden information. People’s Choice Award Table: Help visitors understand how they can vote for their favorite fairy house. Be sure to wear comfortable shoes. Fairy costumes encouraged! Welcome Gate: Welcome visitors to Bedrock Gardens, collect donations, hand out maps, provide general information. Woodland Village (FFH entrance): Dress up in your best FHH outfit and welcome visitors to the FHH trail – help them sign the guest book and explain the voting process. This is a great opportunity for volunteers who like to socialize with visitors!